Vamos aprender na tabela abaixo como dizer as horas em inglês dentro do período da 5 da manhã. Existe diversas formas de se dizer o mesmo horário em inglês. Por isso, montamos essa tabela abaixo com todas as horas em inglês por extenso das 05:00 a 05:59 para você aprender definitivamente. So let’s get started our lesson (Então vamos começar a nossa lição)! São várias formas de se escrever as horas em inglês, então para te ajudar a memorizar cada uma delas de uma forma mais fácil e rápida, indicamos o Anki, uma ferramenta que irá rotacionar todas as palavras e frases que você colocar lá em dias e semanas diferentes para que você possa estar sempre relembrando em intervalos de espaços maiores. Ficou confuso? Então veja esse tutorial completo aonde explicamos em detalhes como funciona o Anki e como baixar essa ferramenta gratuita. Nossa tabela abaixo se iniciar com a hora exata em inglês (Five o’clock / 5 horas em ponto). 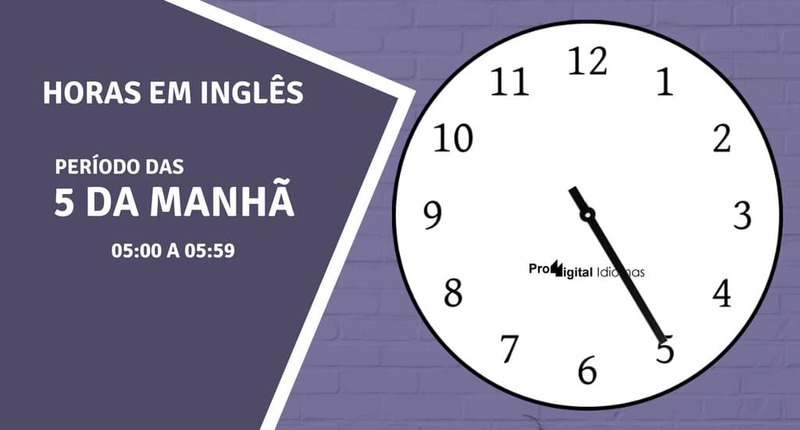 Na língua inglesa, é comum o uso da expressão em inglês “o’clock” para designar determinada hora exata. Abaixo podemos ver isso nos dois primeiros campos. Depois vamos seguir descendo a página e aprender como dizer as horas em inglês das 05:00 às 05:14. One minute past five One minute past five a.m.
One past five One past five a.m.
Fifty-nine minutes to six Fifty-nine minutes to six a.m.
Five one Five one a.m.
Two minutes past five Two minutes past five a.m.
Two past five Two past five a.m.
Fifty-eight minutes to six Fifty-eight minutes to six a.m.
Five two Five two a.m.
Three minutes past five Three minutes past five a.m.
Three past five Three past five a.m.
Fifty-seven minutes to six Fifty-seven minutes to six a.m.
Five three Five three a.m.
Four minutes past five Four minutes past five a.m.
Four past five Four past five a.m.
Fifty-six minutes to six Fifty-six minutes to six a.m.
Five four Five four a.m.
Five minutes past five Five minutes past five a.m.
Five past five Five past five a.m.
Fifty-five minutes to six Fifty-five minutes to six a.m.
Five five Five five a.m.
Six minutes past five Six minutes past five a.m.
Six past five Six past five a.m.
Fifty-four minutes to six Fifty-four minutes to six a.m.
Five six Five six a.m. Seven minutes past five Seven minutes past five a.m. Seven past five Seven past five a.m.
Fifty-three minutes to six Fifty-three minutes to six a.m.
Five seven Five seven a.m. Eight minutes past five Eight minutes past five a.m. Eight past five Eight past five a.m.
Fifty-two minutes to six Fifty-two minutes to six a.m.
Five eight Five eight a.m.
Nine minutes past five Nine minutes past five a.m.
Nine past five Nine past five a.m.
Fifty-one minutes to six Fifty-one minutes to six a.m.
Five nine Five nine a.m. Ten minutes past five Ten minutes past five a.m. Ten past five Ten past five a.m.
Fifty minutes to six Fifty minutes to six a.m.
Five ten Five ten a.m.
Eleven minutes past five Eleven minutes past five a.m.
Eleven past five Eleven past five a.m.
Forty-nine minutes to six Forty-nine minutes to six a.m.
Five eleven Five eleven a.m.
Twelve minutes past five Twelve minutes past five a.m.
Twelve past five Twelve past five a.m.
Forty-eight minutes to six Forty-eight minutes to six a.m.
Five twelve Five twelve a.m.
Thirteen minutes past five Thirteen minutes past five a.m.
Thirteen past five Thirteen past five a.m.
Forty-seven minutes to six Forty-seven minutes to six a.m.
Five thirteen Five thirteen a.m.
Fourteen minutes past five Fourteen minutes past five a.m.
Fourteen past five Fourteen past five a.m.
Forty-six minutes to six Forty-six minutes to six a.m.
Five fourteen Five fourteen a.m.
Geralmente os nativos da língua inglesa usam a expressão “a quarter past” (e quinze minutos / um quarto passado / um quarto depois) para designar que já se passaram 1/4 da hora cheia, ou seja, se passaram 15 minutos após a hora exata em inglês. Vamos ver abaixo como essa expressão é aplicada e depois vamos seguir aprendendo como dizer as horas em inglês entre 05:15 a 05:29. Fifteen minutes past five Fifteen minutes past five a.m.
Fifteen past five Fifteen past five a.m.
Forty-five minutes to six Forty-five minutes to six a.m.
Five fifteen Five fifteen a.m.
A quarter past five A quarter past five a.m.
Sixteen minutes past five Sixteen minutes past five a.m.
Sixteen past five Sixteen past five a.m.
Forty-four minutes to six Forty-four minutes to six a.m.
Five sixteen Five sixteen a.m.
Seventeen minutes past five Seventeen minutes past five a.m.
Seventeen past five Seventeen past five a.m.
Forty-three minutes to six Forty-three minutes to six a.m.
Five seventeen Five seventeen a.m.
Eighteen minutes past five Eighteen minutes past five a.m.
Eighteen past five Eighteen past five a.m.
Forty-two minutes to six Forty-two minutes to six a.m.
Five eighteen Five eighteen a.m.
Nineteen minutes past five Nineteen minutes past five a.m.
Nineteen past five Nineteen past five a.m.
Forty-one minutes to six Forty-one minutes to six a.m.
Five nineteen Five nineteen a.m.
Twenty minutes past five Twenty minutes past five a.m.
Twenty past five Twenty past five a.m.
Forty minutes to six Forty minutes to six a.m.
Five twenty Five twenty a.m.
Twenty-one minutes past five Twenty-one minutes past five a.m.
Twenty-one past five Twenty-one past five a.m.
Thirty-nine minutes to six Thirty-nine minutes to six a.m.
Five twenty-one Five twenty-one a.m.
Twenty-two minutes past five Twenty-two minutes past five a.m.
Twenty-two past five Twenty-two past five a.m.
Thirty-eight minutes to six Thirty-eight minutes to six a.m.
Five twenty-two Five twenty-two a.m.
Twenty-three minutes past five Twenty-three minutes past five a.m.
Twenty-three past five Twenty-three past five a.m.
Thirty-seven minutes to six Thirty-seven minutes to six a.m.
Five twenty-three Five twenty-three a.m.
Twenty-four minutes past five Twenty-four minutes past five a.m.
Twenty-four past five Twenty-four past five a.m.
Thirty-six minutes to six Thirty-six minutes to six a.m.
Five twenty-four Five twenty-four a.m.
Twenty-five minutes past five Twenty-five minutes past five a.m.
Twenty-five past five Twenty-five past five a.m.
Thirty-five minutes to six Thirty-five minutes to six a.m.
Five twenty-five Five twenty-five a.m.
Twenty-six minutes past five Twenty-six minutes past five a.m.
Twenty-six past five Twenty-six past five a.m.
Thirty-four minutes to six Thirty-four minutes to six a.m.
Five twenty-six Five twenty-six a.m.
Twenty-seven minutes past five Twenty-seven minutes past five a.m.
Twenty-seven past five Twenty-seven past five a.m.
Thirty-three minutes to six Thirty-three minutes to six a.m.
Five twenty-seven Five twenty-seven a.m.
Twenty-eight minutes past five Twenty-eight minutes past five a.m.
Twenty-eight past five Twenty-eight past five a.m.
Thirty-two minutes to six Thirty-two minutes to six a.m.
Five twenty-eight Five twenty-eight a.m.
Twenty-nine minutes past five Twenty-nine minutes past five a.m.
Twenty-nine past five Twenty-nine past five a.m.
Thirty-one minutes to six Thirty-one minutes to six a.m.
Five twenty-nine Five twenty-nine a.m.
Uma expressão em inglês bastante frequente entre os nativos da língua inglesa é o “half past” (e meia / meia hora passado). Eles usam essas expressões para quando querem designar que já se passaram os 30 minutos em inglês após das 5 horas exata, ou seja, “5 horas e 30 minutos” ou “30 minutos passado das 5”. Vamos ver abaixo como isso fica no inglês, e depois seguir aprendendo como dizer as horas em inglês entre 05:30 a 05:44. Thirty minutes past five Thirty minutes past five a.m.
Thirty past five Thirty past five a.m.
Thirty minutes to six Thirty minutes to six a.m.
Five thirty Five thirty a.m.
Half past five Half past five a.m.
Thirty-one minutes past five Thirty-one minutes past five a.m.
Thirty-one past five Thirty-one past five a.m.
Twenty-nine minutes to six Twenty-nine minutes to six a.m.
Five thirty-one Five thirty-one a.m.
Thirty-two minutes past five Thirty-two minutes past five a.m.
Thirty-two past five Thirty-two past five a.m.
Twenty-eight minutes to six Twenty-eight minutes to six a.m.
Five thirty-two Five thirty-two a.m.
Thirty-three minutes past five Thirty-three minutes past five a.m.
Thirty-three past five Thirty-three past five a.m.
Twenty-seven minutes to six Twenty-seven minutes to six a.m.
Five thirty-three Five thirty-three a.m.
Thirty-four minutes past five Thirty-four minutes past five a.m.
Thirty-four past five Thirty-four past five a.m.
Twenty-six minutes to six Twenty-six minutes to six a.m.
Five thirty-four Five thirty-four a.m.
Thirty-five minutes past five Thirty-five minutes past five a.m.
Thirty-five past five Thirty-five past five a.m.
Twenty-five minutes to six Twenty-five minutes to six a.m.
Five thirty-five Five thirty-five a.m.
Thirty-six minutes past five Thirty-six minutes past five a.m.
Thirty-six past five Thirty-six past five a.m.
Twenty-four minutes to six Twenty-four minutes to six a.m.
Five thirty-six Five thirty-six a.m.
Thirty-seven minutes past five Thirty-seven minutes past five a.m.
Thirty-seven past five Thirty-seven past five a.m.
Twenty-three minutes to six Twenty-three minutes to six a.m.
Five thirty-seven Five thirty-seven a.m.
Thirty-eight minutes past five Thirty-eight minutes past five a.m.
Thirty-eight past five Thirty-eight past five a.m.
Twenty-two minutes to six Twenty-two minutes to six a.m.
Five thirty-eight Five thirty-eight a.m.
Thirty-nine minutes past five Thirty-nine minutes past five a.m.
Thirty-nine past five Thirty-nine past five a.m.
Twenty-one minutes to six Twenty-one minutes to six a.m.
Five thirty-nine Five thirty-nine a.m.
Forty minutes past five Forty minutes past five a.m.
Forty past five Forty past five a.m.
Twenty minutes to six Twenty minutes to six a.m.
Five forty Five forty a.m.
Forty-one minutes past five Forty-one minutes past five a.m.
Forty-one past five Forty-one past five a.m.
Nineteen minutes to six Nineteen minutes to six a.m.
Five forty-one Five forty-one a.m.
Forty-two minutes past five Forty-two minutes past five a.m.
Forty-two past five Forty-two past five a.m.
Eighteen minutes to six Eighteen minutes to six a.m.
Five forty-two Five forty-two a.m.
Forty-three minutes past five Forty-three minutes past five a.m.
Forty-three past five Forty-three past five a.m.
Seventeen minutes to six Seventeen minutes to six a.m.
Five forty-three Five forty-three a.m.
Forty-four minutes past five Forty-four minutes past five a.m.
Forty-four past five Forty-four past five a.m.
Sixteen minutes to six Sixteen minutes to six a.m.
Five forty-four Five forty-four a.m.
No horário das 5:45, nós brasileiros costumamos dizer tanto 5 horas e 45 minutos quanto 15 minutos para as 6 horas. E para os nativos do idioma inglês não é diferente. Eles também usam esse mesmo padrão, aonde o mais frequente de se ouvir no dia a dia é os 15 para as 6 que é representado pela expressão “a quarter to“. Vamos ver como fica o uso dessa expressão na escrita e depois vamos ver como dizer as horas em inglês entre 05:45 a 05:59. Forty-five minutes past five Forty-five minutes past five a.m.
Forty-five past five Forty-five past five a.m.
Fifteen minutes to six Fifteen minutes to six a.m.
Five forty-five Five forty-five a.m.
A quarter to six A quarter to six a.m.
Forty-six minutes past five Forty-six minutes past five a.m.
Forty-six past five Forty-six past five a.m.
Fourteen minutes to six Fourteen minutes to six a.m.
Five forty-six Five forty-six a.m.
Forty-seven minutes past five Forty-seven minutes past five a.m.
Forty-seven past five Forty-seven past five a.m.
Thirteen minutes to six Thirteen minutes to six a.m.
Five forty-seven Five forty-seven a.m.
Forty-eight minutes past five Forty-eight minutes past five a.m.
Forty-eight past five Forty-eight past five a.m.
Twelve minutes to six Twelve minutes to six a.m.
Five forty-eight Five forty-eight a.m.
Forty-nine minutes past five Forty-nine minutes past five a.m.
Forty-nine past five Forty-nine past five a.m.
Eleven minutes to six Eleven minutes to six a.m.
Five forty-nine Five forty-nine a.m.
Fifty minutes past five Fifty minutes past five a.m.
Fifty past five Fifty past five a.m. Ten minutes to six Ten minutes to six a.m.
Five fifty Five fifty a.m.
Fifty-one minutes past five Fifty-one minutes past five a.m.
Fifty-one past five Fifty-one past five a.m.
Nine minutes to six Nine minutes to six a.m.
Five fifty-one Five fifty-one a.m.
Fifty-two minutes past five Fifty-two minutes past five a.m.
Fifty-two past five Fifty-two past five a.m. Eight minutes to six Eight minutes to six a.m.
Five fifty-two Five fifty-two a.m.
Fifty-three minutes past five Fifty-three minutes past five a.m.
Fifty-three past five Fifty-three past five a.m. Seven minutes to six Seven minutes to six a.m.
Five fifty-three Five fifty-three a.m.
Fifty-four minutes past five Fifty-four minutes past five a.m.
Fifty-four past five Fifty-four past five a.m.
Six minutes to six Six minutes to six a.m.
Five fifty-four Five fifty-four a.m.
Fifty-five minutes past five Fifty-five minutes past five a.m.
Fifty-five past five Fifty-five past five a.m.
Five minutes to six Five minutes to six a.m.
Five fifty-five Five fifty-five a.m.
Fifty-six minutes past five Fifty-six minutes past five a.m.
Fifty-six past five Fifty-six past five a.m.
Four minutes to six Four minutes to six a.m.
Five fifty-six Five fifty-six a.m.
Fifty-seven minutes past five Fifty-seven minutes past five a.m.
Fifty-seven past five Fifty-seven past five a.m.
Three minutes to six Three minutes to six a.m.
Five fifty-seven Five fifty-seven a.m.
Fifty-eight minutes past five Fifty-eight minutes past five a.m.
Fifty-eight past five Fifty-eight past five a.m.
Two minutes to six Two minutes to six a.m.
Five fifty-eight Five fifty-eight a.m.
Fifty-nine minutes past five Fifty-nine minutes past five a.m.
Fifty-nine past five Fifty-nine past five a.m.
One minute to six One minute to six a.m.
Five fifty-nine Five fifty-nine a.m. Very good! Essa foi a nossa lição aonde pudemos aprender as horas no período das 5 da manhã em inglês. Simples, não é mesmo? Repasse essa lição mais e mais vezes até você conseguir aprender como dizer as horas em inglês, minuto por minuto. Você se lembra de mais alguma forma de se dizer as horas em inglês? Então contribua com todos os alunos dessa aula. Basta apenas deixar nos comentários abaixo. Se você gostou dessa aula, então continue aprendendo com nossas dicas de inglês e com nossas videoaulas de inglês. E se precisar de ainda mais aprendizagem, então acesse essas dicas de sites gratuitos para aprender inglês online.